This time of year our garden is over loaded with cucumbers. We have passed them out at the office and given them to neighbors, but this soup is always a hit. So when you find yourself with extra cucumbers and a need for a perfect summer soup this is the quick answer. peel cucumbers, seed and dice, sprinkle with salt and let stand for 30 minutes. Drain off water in a colander and rinse with fresh water. Place cucumbers in blender, add parsley, green onions, dill, lemon juice, buttermilk, sour cream and milk. Blend at high speed until smooth. Add white pepper and taste for salt. Chill for at least 2 hours or more. This trip to France took a different bent. I decided to rent an apartment in Paris for 4 days to see how it would compare to staying in a hotel. I researched on line and made all the arrangements through a group called Habitat Parisien, habitatparisien@me.com. My goal was to try a couple of new restaurants and explore a few antique markets I had not visited for years. 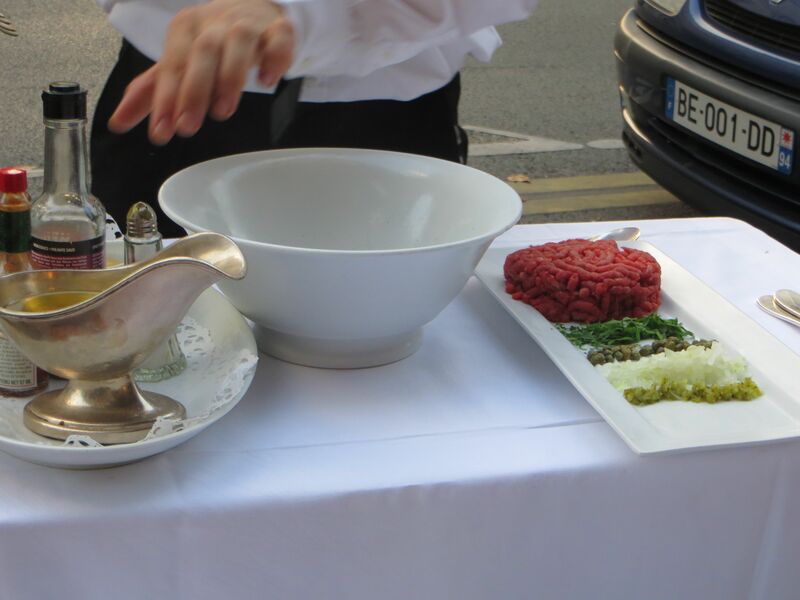 This is what I found: first night we had dinner at “Josephine chez Dumonet”–117 rue du cherche-midi, it was great, just like all the reviews I had read. Be sure to make reservations so you can sit outside in the summer. I loved the steak tartar but it was more than enough for us to share. Next morning we were up early to head to the antique market at “Puces de Vanves”, near Porte de Vanves. I found some good silver pieces and old linen towels. The other market to go to on Friday is Ave President Wilson, between Rue Debrousse and Place d’lena. Both of the Flea markets open at 9am so go early for the best selection. The flea market we did not get to was ‘Puces de Montreuil” in the 20th. We took the bus back to into the heart of town had a fun lunch at Le Grand Café on Boulevard des Capucines. Since it was so hot we were happy to sit outside in the shade. We took 4 bikes from one of the many bike racks on the street. It is only a few euros to rent a bike, just be aware you will need to find an empty space to drop the bike and that can be tough to manage anytime around 5pm in the Latin Quarter. The next day we headed out to visit the museums, always a quick walk through Musee de l’Orangerie and walk through the park to just people watch and admire the gardens. Back to the apartment to drop our purchases and go to lunch around the corner at the beautiful restaurant in the courtyard of the Ralph Lauren store. the restaurant, Ralph is located at 173 Boulevard ST.Germain, it is a beautiful place to sit and enjoy the cool garden and enjoying an American menu. It is expensive but worth the money. the best fish burger you will ever have. Don’t miss the true French fries. The rest of the afternoon was spent exploring for the next special gift to take home. We walked along the Seine river watching the boats and all the people sitting on the newly created Paris beach, including beach chairs, sand and water spraying for the kids, and adults to cool off. Dinner was at Bistro Paul Bert, 18 Rue Paul Bert. They offer a 3 course menu,36 euro each, that gave plenty of choices but the desserts were the GRAND finally. I had the floating island and it was served on a dinner plate. the one draw back is there is no air conditioning, and only a couple of fans in the whole place. Outside on the side walk there are only 4 small tables. Beware on a hot evening! The next morning we left our special apartment and headed to the train station. We took the train to Avignon, make sure to get reserved seats and pack a picnic for the trip. We pickup up our rented car and headed to Nyons to visit our friends Lydie and Wayne. Nyons is the best place to buy lavender oil, black olives and the purist olive oil in France. Each village in the area has a local market selling beautiful fresh produce, this time of year garlic is king, and local crafts. Our favorite village is called ( L’isle sur la Sorgue) about an hour 20 minute drive south but worth the trip. they have great antique shops and their market once a week is amazing. We had a nice lunch at “La Balade des Saveurs” along the river seated under a cool awning. Most of our time in Nyons was spent cooking at home and sharing the local fresh food found at the market. Our side trip to Vinsobres for lunch at Petit Bistrot was fun but be sure to be seated before 2pm or they will not serve you. The rest of the group did do a 3 hour raft trip down one of the mountain rivers and had a good time. At this time of the year the rivers are low so it is easy to paddle the plastic canoe by yourself. Just another adventure. Time to head home, so we left early to drive just outside of Orange arriving at a small well know restaurant called “L’Angelus” a simple 3 course lunch is 13 Euros. 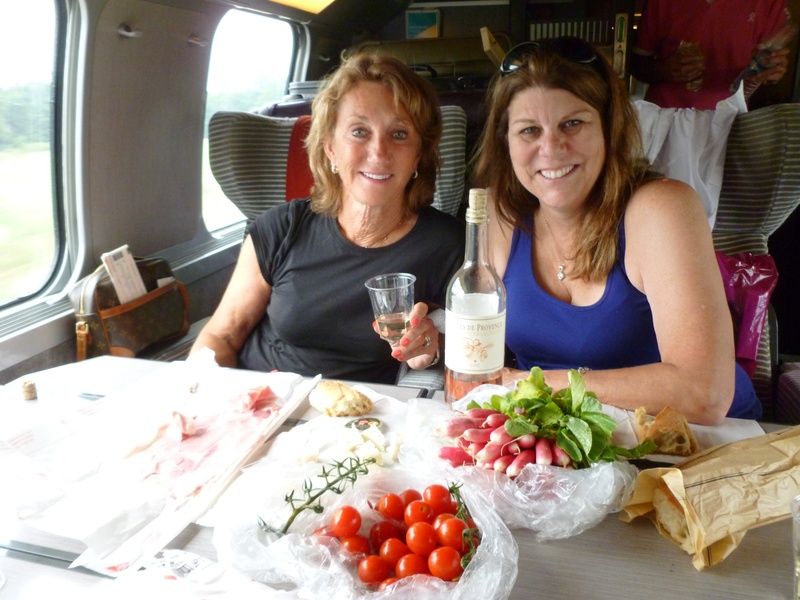 We had our last glass of local Rose and headed back to the train station for our trip back to Paris. When you go through the Gare de Lyon train station if you have a moment go up the stairs and look at the restaurant (Le Train Blue)It is a walk back in history of what train travel must have been like. Great last night dinner at “Chez Julien”, I had tried to get in several years ago and was thrilled to be seated outside for a fun filled sharing of wine, food and people watching. Make reservations, 01-42-78-31-64, 1 Rue DuPont. I started with beignet fried shrimp and knew after the first taste we could not find a better last supper in Paris.